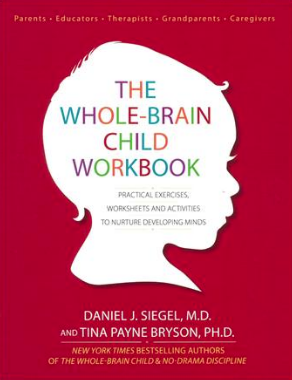 Buying Tip: If your child or client is a visual learner, this book is for you. Using YouTube clips is a really accessible and fun way to teach about the social world. 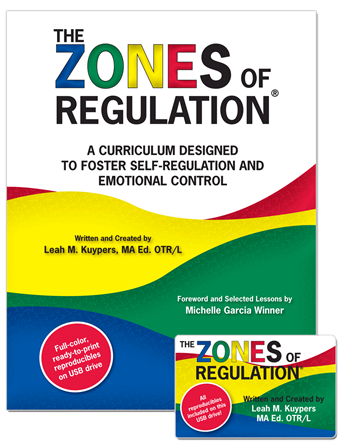 YouCue Feelings is a great companion to Anna’s other book Movie Time Social Learning and Leah Kuypers book The Zones of Regulation. 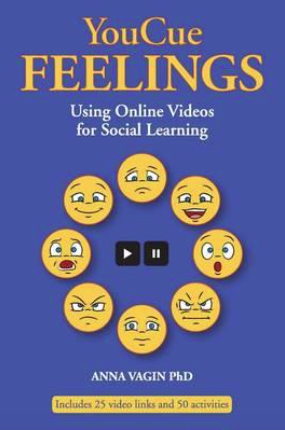 YouCue Feelings: Using Online Videos for Social Learning, focuses on expanding emotional vocabulary, ability to track changes in feeling states, and reflect on one’s own emotional experiences and uses YouTube videos as the context for social learning. 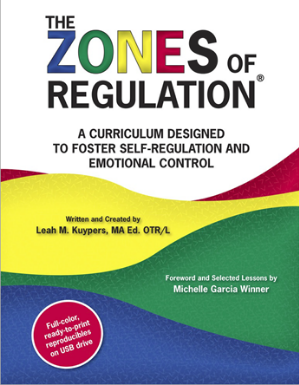 YouCue Feelings was specifically written for therapists, teachers and parents of Kindergarten, through primary school, to middle high school students. The book uses YouTube videos that are suitable for a wide age range. “If your emotional abilities aren’t in hand, if you don’t have self-awareness, if you are not able to manage distressing emotions, if you can’t have empathy and have effective relationships, then no matter how smart you are, you are not going to get very far.” – Daniel Goleman, author of Emotional Intelligence (2005). Feelings are a crucial element of social relationships, yet students with social learning challenges (some with diagnoses such as Autism Spectrum, Social Communication Disorder or ADHD) frequently have limited understanding of emotions. YouCue Feelings aims to help students with such challenges to acquire social relationship skills that will improve their capacity for effective, fulfilling relationships with family members, people at their school or work, and members of their broader community. YouCue Feelings simplifies such learning using a relatively new form of storytelling – online videos – to accelerate learning about feelings and relationships. YouCue Feelings includes summaries and titles of 25 wonderful online, easily accessed videos. Each has been selected for its portrayal of rich social relationships and crucial social learning concepts. YouCue Activities, done in conjunction with video viewing, make up the core of the YouCue Feelings program. 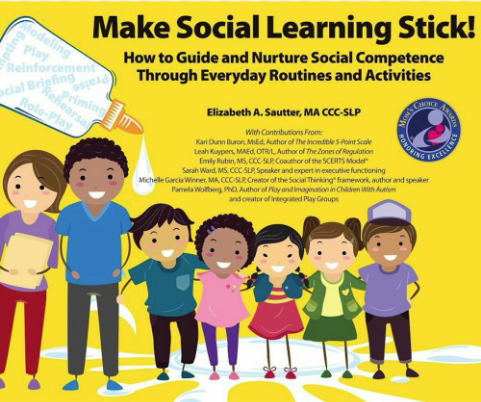 These activities range from simple drawing projects or discussions about the characters in a YouTube video, to more sophisticated activities such as building connections between the social learning concepts in videos and what happens in a student’s everyday life. There 25 activities in Level 1, focusing on the characters in the videos. Level 2 contains 25 additional activities that use video viewing to jumpstart discussions about the student’s own emotional experiences. In this first book of a series, author Anna Vagin, PhD, draws on her thirty years of experience working with children to show therapists, teachers, and parents how to support elementary and middle school students in building their emotional vocabulary, tracking changes in feelings over time, and increasing their ability to reflect on their own emotional experiences. 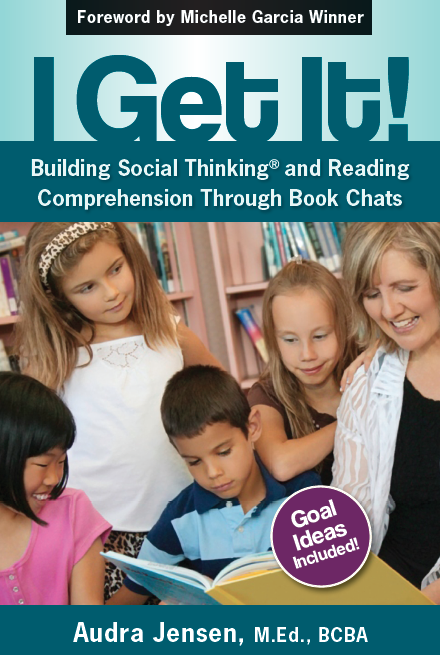 YouCue Feelings guides students in thinking about, talking about, and ultimately, practicing important social learning ideas in their everyday lives. 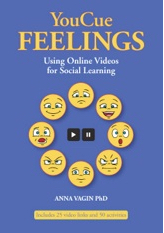 “YouCue Feelings complements Anna’s book Movie Time Social Learning, and provides resources and tips for helping individuals decipher their own and others’ emotions. Since the lessons are explored through media clips posted on YouTube, the information is especially relevant and absorbing!” – Social Thinking Founder Michelle Garcia Winner. “YouCue Feelings is an exciting, engaging way of building children’s social abilities using YouTube videos. Dr Vagin has used her extensive experience with children with special challenges to thoughtfully develop a program that is easy to read and use. 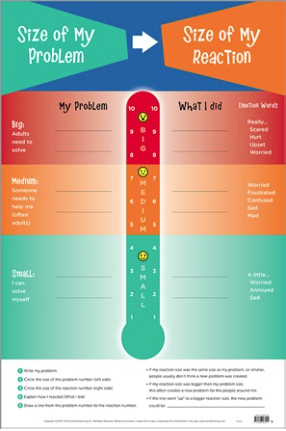 YouCue Feelings is progressive and adaptable to students at different levels. It is illustrated well, fun and useful for everyone! 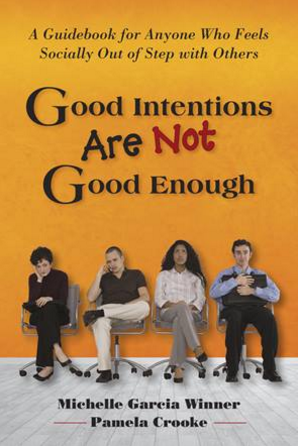 I highly recommend it.” – Robert I. Hendren, DO, Professor and Vice Chair, Department of Psychiatry, Director of Child and Adolescent Psychiatry, University of California, San Francisco.